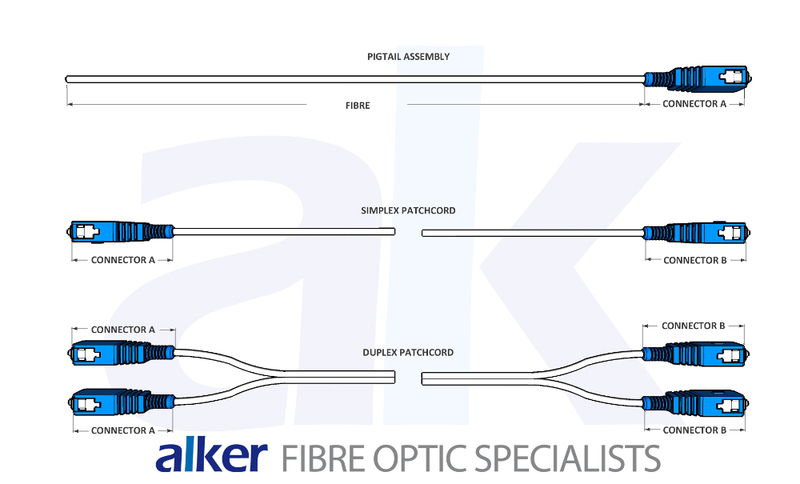 At alker we hold connectors and fibre on stock and can tailor-make any assembly here in our UK facility in Surrey. Using our online stores you can build the patchcord or pigtail that you require, we do not limit you to a small range of predetermined fibre optic lead configurations. As we are manufacturing your jumper to order we have a lead time of 48hrs for our production team to terminate, polish and test every assembly. If you require large production runs we would be happy to provide you with a quote and we can offer multiple shipments to meet your production or installation schedule. What is a Patchcord or Pigtail? The term fibre optic ‘patchcord’ is also refereed to as a Jumper, Jumper cable, Lead, Assembly, Cable, Patch cable and more. They traditionally refer to a length of fibre optic cable which has been terminated at both ends with fibre optic connectors. They are most commonly used to connect two pieces of fibre optic equipment together and their aim is to lose as little light as possible which is measured as a decibel (dB) loss or attenuation. 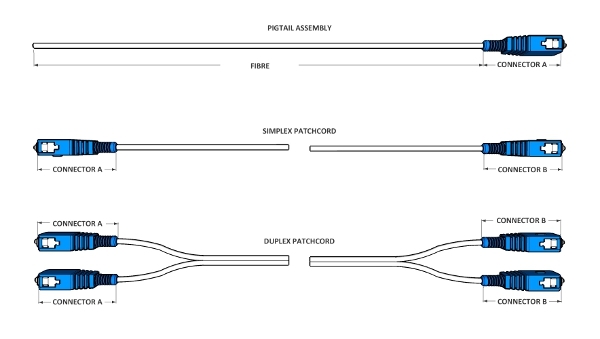 The term ‘pigtail’ traditionally refers to a short length of fibre optic cable with a fibre optic connector at one end and a bare cleaved end at the other. Pigtails are used, for example, by splicing on a fibre optic component such as a laser, coupler or a multiway fibre optic cable within a splice tray in a rack. 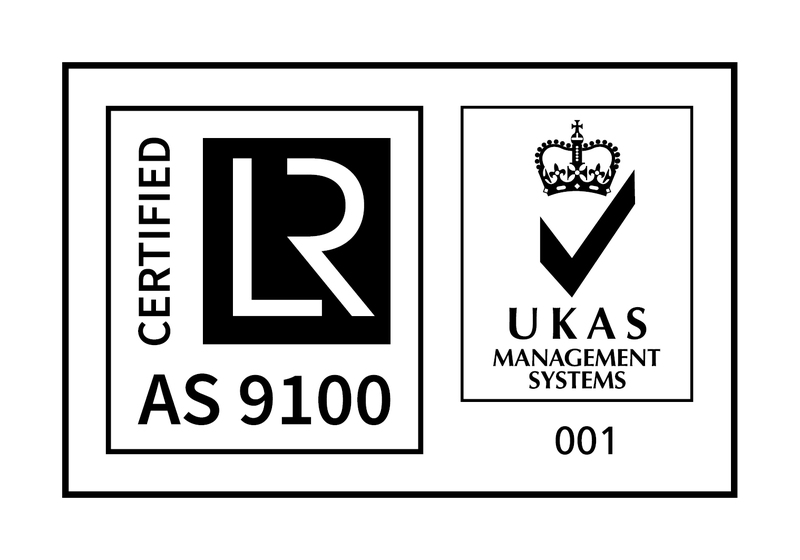 By only using the best quality components from supplier such as Senko, seikoh giken, R&M, Diamond, AMP and Avago and fibre from Corning, fujikura, OCC and Nufern alker ensure that all the assemblies we manufacture are of the highest specification with precise polishes and low insertion loss results so they are ‘right first time’ for our customers. There are no minimum order quantities on our manufactured assemblies so if you need one assembly or hundreds you can be sure alker is the termination house for your fibre optic needs. We hold a number of connector types and fibre in stock, if you cannot build the assembly that you need please contact us on 01342 870 941.